Hanging out by the whale. Emma, my daughter, is the one wearing the costume. 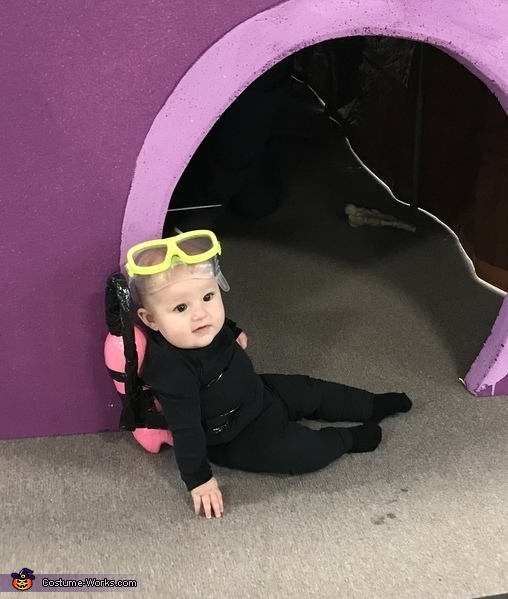 She is 5 months old and was a scuba diver this year. My husband saw a picture somewhere and loved it and ran with the idea. She simply wore black leggings and a black turtleneck as her wet suit. For the tank we took a 1 liter dr. Pepper bottle and squirted pink paint inside and worked it around until the whole thing was painted from the inside. Then attached a tube and put in some goggles.